My first introduction to Joseph Holbrooke’s music was his tone poem The Birds of Rhiannon, op.87 (1925). This had been released on a Lyrita record in 1979 coupled with Cyril Rootham’s Symphony No.1 (SRCS103 LP: SRCD269 CD). It was a number of years before I heard anything else from his pen. In the meantime, I had discovered a copy of the composer’s polemical study of Contemporary British Composers (1925) which I read avidly. It is a book that I enjoyed in spite of its eccentricities and intellectual confusion. Back in 1979 it was difficult to find out much about Holbrooke. There were the usual entries in Grove and other musical dictionaries and encyclopaedias. I was fortunate in being able to borrow G. Lowe’s Josef Holbrooke and his Work (London, 1920) from the library. Yet this book had been written some 38 years before the composer’s death, so it could hardly claim to be up to date. I had a copy of Sydney Grew’s Our Favourite Musicians, from Stanford to Holbrooke (Edinburgh, 1922) in my collection, which was interesting, but again only covered the first half of his life, in a popular manner. In 1937 Josef Holbrooke: Various Appreciations by Many Authors was published by the then-extant Holbrooke Society. The contents included a selection of reprints from contemporary journals as well as some specially written. They featured one or two famous names including Ernest Newman and the composer Richard H. Walthew. It is a volume that I have not seen and is scarce. In the post-war year’s interest in Holbrooke seems to have evaporated, with little written in the academic or popular press. The first stirring of a revival appeared in 1974 when Lewis Foreman and Graham Parlett produced a contemporary discography published in Antique Record. It was not until the nineteen-nineties that some articles began to appear in the musical press, especially the British Music Society Journal and Newsletters. Rob Barnett has contributed an important appreciation on MusicWeb International as well as publishing two major essays by Michael Freeman – ‘Joseph Holbrooke Incognito’ and ‘Joseph Holbrooke and Wales’. An interesting note by Philip Scowcroft examined the composer’s light music. Since that time there has been a small number of CDs issued dedicated to his music. It is possible to find countless contemporary references to Holbrooke in the musical press as well as in many contemporary arts’ journals and daily newspapers. However, there has been no previous attempt to give an overview of the composer, his music and his musicological and political endeavors. 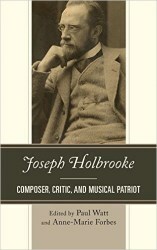 Joseph Holbrooke: Composer, Critic and Musical Patriot is the first book to provide a detailed examination of the composer. There is no need to present a detailed biographical sketch of Joseph Holbrooke in this review. Nevertheless, it would not be amiss to give the briefest of overviews which quotes part of the entry in Percy Scholes’ eternally useful Oxford Companion to Music. Holbrooke was born in Croydon in 1878. He studied at the Royal Academy of Music and continued with a busy professional life of ‘great activity and variety’. His catalogue of music has works in every genre including the major opera trilogy The Cauldron of Anwyn (correctly The Cauldron of Annwn). Scholes concludes with a very astute sentence: [Holbrooke] ‘has composed fluently and ably … sometimes without sufficient self-criticism. As a controversialist he used to be both vigorous and even violent. He found both creation and destruction agreeable diversions and aimed at possessing a string of critics scalps as long as his list of opus numbers.’ The composer died, virtually forgotten, in 1958. The first section of this book is one of the most valuable: the massive chronology of ‘Holbrooke’s Life and Music’ assembled by Rob Barnett. It extends to more than 30 pages. As an example, the entry for ‘August 1915’ notes the premiere of The Enchanter, op.70 in Chicago, a performance of the Imperial March, op.26 at Bournemouth under Dan Godfrey and a fugitive Romance op.59b for viola and piano in the Wigmore Hall. Generally, entries include details of when works were begun and completed, the composer’s travel arrangements and holidays at home and abroad and the death of people associated with Holbrooke. Naturally, any reception history of Holbrooke’s music will have to be cross-checked with contemporary programmes, adverts and reviews, but this chronology is critical to all subsequent study of the composer. The first chapter, also by Rob Barnett, gives a concise overview of the composer, both biographical and musical. It is essential reading before beginning to explore the more specific and detailed essays in the remainder of this book. Barnett has been an enthusiast of Holbrooke’s music since hearing the tone poem Ulalume in 1984 and has spent much time researching and writing about the composer and compiling an annotated catalogue of his music. David Craik has investigated Holbrooke’s ‘Friendship with Granville Bantock’. This chapter examines this relationship by way of some 150 letters in the Bantock Collection at the University of Birmingham. Holbrooke was fortunate in having such a friend who was not fazed by his outbursts and often outrageous polemics. Craik writes that Bantock ‘exercised a paternalistic and fraternal relationship with Holbrooke’ from the first meeting at Liverpool in 1895 until Bantock’s death in 1946. Although the two composers had widely varying musical aesthetics, both loved North Wales and represented this in their music. Bantock ‘remained a bedrock of almost unconditional encouragement and affection for Holbrooke throughout [his] turbulent career’. One (of many) interesting things I learnt in this chapter was Holbrooke’s intention to write a biography of Bantock. It is not known if the book was completed or if the draft survives. Anne-Marie Forbes, as well as being one of the book’s editors has contributed a chapter on Joseph Holbrooke’s relationship with Thomas Evelyn Scott-Ellis, Eighth Lord Howard de Walden. This larger than life ‘boy’s own’ character had fought in the Boer War, at Gallipoli, sailed yachts, raced speedboats, retained racehorses, owned a Scottish island and some Kenyan forest and was passionate about medieval history and Welsh culture. He became a patron of the composer who himself was deeply influenced by Celticism. Ellis was to provide Holbrooke with the libretto for his operatic trilogy. Equally important, he was to offer financial security, opportunity for holidays in the Mediterranean and travel to Africa and South America. It was Ellis’s influence on Holbrooke that caused the composer to write many Welsh works. These are listed in Appendix 2. Through Ellis, Holbrooke came to share ‘a romantic vision of an unspoiled land … populated with the heroes of mythology and legend’. This chapter includes a major analysis of Holbrooke’ overblown, heart-on-sleeve, but ultimately beautiful Piano Concerto: The Song of Gwyn ap Nudd, which was based on a poem by Ellis. Joseph Holbrooke’s chamber music is the subject of Paul Hopwood’s chapter which examines its neglect and the influence of ‘mass-culture’. After noting the vast amount of chamber music in Holbrooke’s catalogue, Hopwood laments the lack of currently available recordings of these works. He considers that this music suffers almost total neglect. Part of this may be down to the composer’s difficult attitude towards performers and concert promoters. Hopwood argues that the problem is that the chamber works may have been backward-looking, reflecting a kind of ‘deliberate antiquarianism’ but further submits that it reflects the ‘emergence of music produced for the mass consumer market’. It is for that reason it came to be ‘disparaged and ignored by the majority of the musical establishment.’ After a section on contemporary critical response Hopwood examines the ‘Fantasie’ String Quartet no.1 in D (op.17b) (1906) and the Clarinet Quintet in G major, op.27 no.2 (1910) in some considerable technical detail complete with musical examples. Paul Rodmell notes that the limited scholarship on Holbrooke and his music has concentrated on the ‘neo-Wagnerian’ trilogy, The Cauldron of Annwn. This chapter examines the early and rather more modest and musically less-challenging opera Pierrot and Pierrette (1908) and the chamber ballet The Enchanted Garden (1915). It places this music within the context of the ‘unpropitious environment for opera composers’ in Britain at that time. One of the reasons for this was the relatively poor quality of the librettos. Rodmell concludes his examination of these works by suggesting that both works contained ‘some fine and impressive music’ however they remain unsatisfactory due in part to their libretti. The problem with this is that there are no recordings that would allow the reader to hear the music. Furthermore, in the case of Pierrot the orchestral parts or full score have disappeared. This severely hampers any chance of it being performed unless in a ‘scratch’ or ‘chamber’ version derived from the vocal score with piano accompaniment. One of the most interesting, if difficult, chapters in this book is Michael Allis’ detailed study of ‘Holbrooke and Poe Revisited: Refiguring The Raven as the Musical Uncanny’. Most enthusiasts of Holbrooke will know that Poe was one of the composer’s favourite authors, which resulted in some thirty works which, to one extent or another, were inspired by the American author’s stories or poems. A list of these is included by Allis. This chapter studies Poe’s impact on Holbrooke, interestingly noting other composers who were inspired by the author. The major part of this essay is dedicated to a comprehensive study of Holbrooke’s orchestral poem The Raven. The work was well-received by the British musical press and this leads Allis to explore the context of ‘other attempts to reformulate Poe’s poems in alternative artistic forms’. To this end he examines a number of illustrations for the printed text of The Raven by Dore, W.L. Taylor and Heath Robinson. He then examines how the ‘uncanny’ could be ‘invoked in musical terms by the composer’. I referred above to Joseph Holbrooke’s book Contemporary British Composer. Much as I enjoyed this book when I first discovered it, I did feel that there was something a little xenophobic about it. I guess that Holbrooke’s attempt to categorise composers by their relative Britishness seemed to me taking music nationalism too far. I accept that he wanted to campaign for ‘the advancement of British music that is free from foreign influence’. Yet it is one thing to bemoan the lack of attention to native-born composers by artists, benefactors and institutions; it is another to suggest that there is a hierarchy of ‘degrees of Britishness’ which creates various classes of composer. Presumably, for Holbrooke, the more British the better? Holbrooke divided the composers in his study into three groups: for example the first had ‘solid British names and parentages and often training’. It featured Elgar, Bantock, Bridge and Boughton. The second group includes Delius, Holst, Coleridge-Taylor and Goossens of whom ‘none can pretend that those are of British parentage …’ The third group to a large extent defies categorisation but ‘speculates’ on eight younger men including Bliss, Howells, Baines and Foulds. Interestingly, Holbrooke does not define what he believes to be a ‘British style’. And finally the composer himself was sometimes dubbed as ‘The Cockney Wagner’ so even he was not beyond foreign influence. In the chapter, ‘A Nationalist in Art’ Paul Watt analyses Holbrooke’s nationalist agenda by way of a detailed study of Contemporary British Composer with a critique of the text and perhaps more vitally by its contemporary reception especially by Ernest Newman. The problem is well-summed up by the critic Jack Westrup who stated ‘in appraising the work of our fellow countrymen there is always the danger of an aggressive nationalism.’ Watt attempts not so much to excuse Holbrooke’s ‘aggressive nationalism’ but to look at the ‘ideology that underpinned the expression of his hopes for a better musical future, in which British composers would be celebrated … and the British public … would be patriotic and proud’. The 1966 edition of Grove states that ‘the catalogue of … works is enormous and though many are published, more have remained in manuscript and are often difficult to access. Even those in print have changed publishers repeatedly.’ It then gives what it calls a ‘selection from the more important works …’ The current Grove is more detailed, but is still a selection, with for example, a blank heading indicating ‘Works for Unaccompanied Chorus’ and ‘Song incl.’ followed by a few titles and ‘many others’. There is a detailed works list on Wikipedia which is listed ‘chronologically, where possible, by opus number and by category’. In this present volume Rob Barnett has contributed a monumental document entitled ‘Notes towards a Work List.’ Allowing for the fact that any composer’s catalogue is ‘provisional’ Holbrooke’s is ‘more [so] than most.’ Barnett admits that the ‘evidence left by Holbrooke and his publishers points in various directions’ so the ‘work list’ is largely tentative and will inevitably be superseded. The list is presented in the sequence of opus numbers, however many works exist outside of this category. Each piece is itemised, along with subdivisions of movements, variations or songs where appropriate. Holbrooke seemed to enjoy giving works alternative titles – the tone-poem The Viking, op.32 (1899) was originally called The Skeleton in Armour and possibly The Corsair. Details of first performances are given where known, although I imagine that these particulars will be added to as scholarship (I hope) explores Holbrooke’s reception history more rigorously. In many cases subsequent concerts and broadcasts are also noted. In the listings for the operas and ballets Barnett has included a brief synopsis. Also included is a generic list of works. This certainly highlights how much music Holbrooke wrote: surely one of the stumbling blocks to his reassessment in our time. Finally, there is a list by opus number which one glance at reveals the complexity Holbrooke’s works list. For example, there are six works carrying op.91 – all different genres. The discography is a major part of this book: I was surprised at just how many recordings of Holbrooke’s music have been made over the years. Alas, many are private or are no longer commercially available. The present discography does not include the two CDs of piano music played by Panagiotis Trochopoulous issued on the Cameo Classics label: they were probably released too late for inclusion in this book. Other missing recordings include the Fantasie-Sonate, for cello and piano, op. 19 recorded on the British Music Society label (BMS436CD), by Raphael Wallfisch (cello), Raphael Terroni (piano) and the Sonata for Violin and Piano no 3 in F major, op. 83 Orientale with Jacqueline Roche (violin), Robert Stevenson (piano) on Dutton Epoch (CDLX7219). Typically the discography has been produced by ‘opus number’, however there are a few examples, whether deliberate or not, that appear out of sequence. The lovely waltz Pandora has been included in the listings twice (p.292 and p.300). Aucassin and Nicolette, op. 115 are out of sequence in the text. In fact pages 298 and 299 seem to have become transposed in the printing. Violin Sonata or Sonatina, no.1 op.6a is also out of order from the main run of ‘opus numbers’. Finally, it would have been better if the titles of each work in the discography had been exactly the same as that given in the main ‘Work List’. The ‘References’ division of the book is divided into two sections – ‘Unsigned Articles’ including concert reviews and appreciations, followed by ‘Signed Articles, Books, Chapters, Websites and Reference Works.’ This is the most extensive bibliography of Holbrooke currently available, and will no doubt form the basis of scholarship and study for many years to come. It is broad-based and includes entries on Welsh history, nationalism and Sigmund Freud. In the first section, many of the reviews are simply listed by event. For example, ‘Crystal Palace Concerts’ Musical Standard 13 no.323 March 10, 1900: 151.’ I had to look this up to establish that it was referring to a performance of The Raven. It would have been good to have provided this reference in the catalogue section or to have noted the work in [square brackets]. The comprehensive index provides references to the works discussed in the text as well as those described in ‘Notes towards a Work List’. There are brief biographical details of the editors and contributors given at the end of the book. This volume is well produced, with clear, readable print. There are a number of musical examples and copies of Doré illustrations for The Raven tone poems and the Edgar Alan Poe inspired works. I was disappointed that there were no photographs of the composer and his associates. Joseph Holbrooke: Composer, Critic and Musical Patriot will be of considerable interest to a surprisingly large group of people. Firstly, there are the musical historians for whom this volume will be invaluable in gaining a greater understanding of British music, especially in the first half of the twentieth century. Of especial interest is the detailed examination of Holbrooke’s often misplaced, but strongly held nationalism, as expounded in his Contemporary British Composers. Students of Celtic and Welsh history and arts will require this book as an essential adjunct to their understanding of the influence of that nation’s history, ‘nationalist ideology’ and folklore on the London-born composer. The more general reader will find the examination of Holbrooke’s life of great interest as well as the examination of some of his key chamber and orchestral works prove helpful in gaining an understanding of one of the most important, but neglected, if somewhat wayward, of British composers.